The Lancia brand is famous for making elegant and powerful cars which set them apart from other vehicles available in the segment. 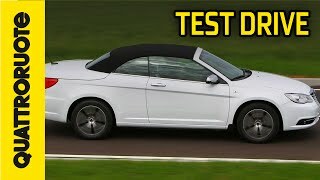 The 2012 Lancia Flavia Cabrio is based on the Chrysler 200 Converitble 2012 and will be released only for the European markets. Under the hood, the Flavia Cabrio is powered by a 2.4 liter petrol engine that can generate an output of 175 Horse power at 6000 RPM and a maximum torque of 225 Nm. The power from the engine is transmitted to the wheels by a 6-speed automatic gearbox. The new Lancia model is also offered with various luxurious features like the six speakers Boston Acoustics Sound System, Automatic climate control, heated and electrically adjustable seats, Electronic traction control and Electronic Stability Control which provide a pleasant driving experience. The car exterior design is quite commendable as it gives the car a glamorous look and at the same time is aerodynamically stable.The rear end of the car has the LED light cluster package combined with a chrome plated bar that looks quite elegant. The stylish Lancia logo on the front end and the 18 inch alloy wheels are the most striking features of the car. The latest model of Lancia is quite roomy and up to 4 persons can comfortably fit in the car. Also the luggage compartment can hold up to 377 liters when the electronically soft top is closed. This is due to the large 276-cm wheelbase and a car length of 4.9m. 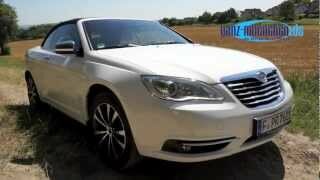 The 2012 Lancia Flavia Cabrio has been showcased at many motor shows and has gained quite popularity among the consumers. It has been revealed that the production of the elegant convertible will be done at the Sterling Heights plant in Michigan. The eagerly awaited car is expected to hit the markets sometime in March. In keeping with the stylistic features of the Lancia brand, the glamorous Flavia Cabrio interprets the Chrysler 200 model being launched on the European market. Following its critical and public success enjoyed at the most prestigious motor shows, today Lancia offers the final version that can be ordered from March in the main European markets and produced at the Sterling Heights plant in Michigan (USA). The Lancia convertible is an interesting alternative for customers who want the benefits of a coupé without giving up the unique sensations that only an open-air car can offer. That is why the new Flavia Cabrio guarantees a fine driving experience unparalleled by any other in its segment, whether tackling the daily trip in town to go to the office or when taking to the splendid scenic roads out of town on week-ends. In terms of length (4.9 metres), height (1.4 m) and width (1.8 m), the new Lancia is at the top of segment D, offering the ultimate in interior room - it can accommodate up to four adults - and on-board comfort with its generous 276-cm wheelbase. Identifiable by an elegant and dynamic look, the Flavia Cabrio has a sculpturesque front sporting the unprecedented grille with Lancia logo and the original front headlights and fog lights. Furthermore, the surface of the side panel is extremely clean, in addition to being distinguished by a sleek line that lengthens the car and gives it dynamism and by elegant 18" alloy wheels. The rear LED light cluster stylistically joined by a thin chrome-plated bar that further enhances its overall look contributes to accentuating the original design. This impression is further reinforced by the unusual chrome-plated tailpipe and by the sophisticated electrically-controlled soft top enclosed inside the hood cover, harmoniously built into the body with the third brake light at its base. The new Flavia Cabrio boasts an entirely respectable luggage compartment thanks to the technological solutions adopted for closing the soft top: 377 and 198 litres, respectively, when the soft top is closed and open. The body colours available are Deep Cherry, Bright White, Silver, Black, Mineral Grey and Blackberry. These colours can be combined with two interior shades - black and the two-tone black and white - and two soft top shades, black and beige. So if "elegance and dynamism" describe the exterior of the new Flavia Cabrio, the guidelines inside are refinement and innovation, in perfect tune with Italian style and the craftsmanship quality that has always distinguished Lancia cars. Aesthetic refinement that flows through the entire passenger compartment and wraps around driver and passengers in a warm "embrace" thanks to the painstaking selection of fine materials, the attention devoted to every minimum detail and the adoption of advanced comfort, safety and driving pleasure features. The new Flavia Cabrio boasts a sophisticated surrounding that will without a doubt win over a customer who seeks exclusiveness, technology and Italian taste in a car. A new console has been created for him. It has elegant chrome-plated frames and a large central display; a brand new steering wheel wrapped in full-grain leather complete with built-in controls for managing radio, cruise control and mobile phone in total safety; and newly designed seats upholstered in fine leather, complete with practical "active" headrests. The captivating Lancia Flavia Cabrio is offered in a single, exclusive version that is "all inclusive". As the name itself intimates, it offers a wealth of standard equipment, from the top quality leather upholstery, electronic stability control (ESC) and electronic traction control, latest-generation ABS and numerous airbags (front multi-stage, side and window bags) to the ISOFIX mountings for transporting children in complete safety, the innovative Uconnect® multimedia system complete with satellite navigation system, Bluetooth and the sophisticated "Boston Acoustics Sound System" that include 6 speakers plus 40GB hard disk (about 6,700 music tracks). In addition to the features described above we have, and once again standard: dusk sensor, radio controls on the steering wheel, automatic climate control, tyre pressure monitoring system (TPMS), soft top that can be operated with remote control, Keyless Entry, heated and electrically adjustable seats, heated and electrically operated door mirrors, electrochromic rear view mirror, and anti-whiplash head restraints. The new Flavia Cabrio is equipped with a 2.4 litre petrol engine combined with a 6-speed automatic transmission that delivers a maximum power of 175 HP at 6000 rpm and a maximum torque of 225 nm at 4400 rpm.